Patience is key when getting ready to freeze bananas for meal prep, especially if you plan to have them ready and on hand for smoothies or baking (mmm banana bread, or banana pancakes - okay now I'm hungry). 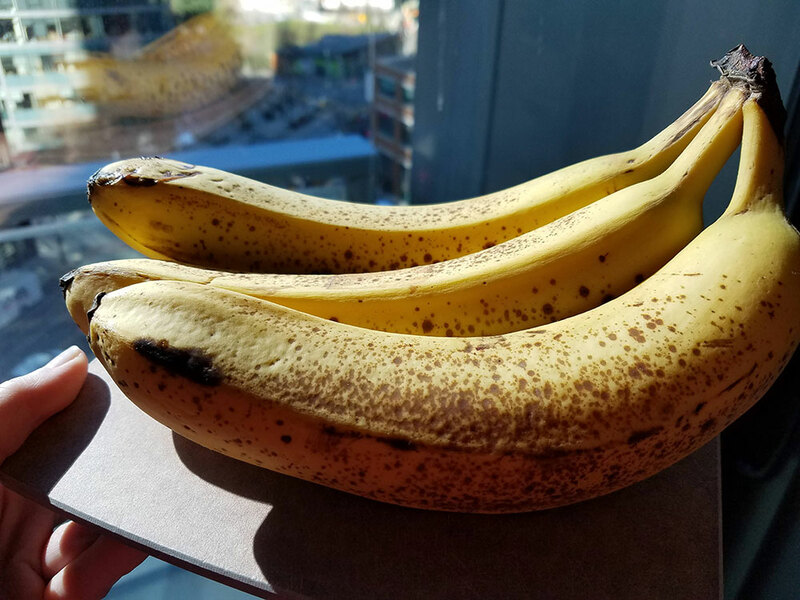 Wait till your bananas start to speckle, they will be covered in these tiny black dots and are at their peak ripeness. They will be slightly fragrant, but not overly aromatic. Their flesh inside the peel will be a soft yellow color and tender to the touch. Speckled, or black spot, bananas have even more health benefits then their perfectly yellowed or green counterparts. Lowering blood pressure, protection against heart attack and prevent muscle cramps. This is due to their increased potassium levels and low sodium count. Natural energy booster as they are calorie-dense, packed with low-glycemic carbohydrates, vitamins and minerals which will give you several hours of energy if you eat two speckled bananas. This is why they make for such an optimal pre-workout snack! Relief from heartburn & indigestion. Speckled bananas smooth texture lines the stomach walls, protecting you from irritation and acids, a natural stomach calmer and digestion aid. Improves your mood thanks to the high levels of tryptophan which boost your serotonin levels. Making you feel happier! Peel your bananas and keep on the phloem bundles, also known as "banana strings". These strings which easily peel away from the flesh are often thought of as an undesirable part of the banana and are typically thrown away. They are packed full of nutrients with even more fiber than the banana itself, and just like the rest of the banana, they are perfectly safe to eat. These bundles are what transports nutrients throughout your banana while it is growing, without them, bananas just wouldn't pack the nutrient punch they do. If you don't find them palatable, feel free to remove them. Once peeled, you can go one of two ways. One way is to slice your bananas into small rounds, lay flat on a cookie sheet and freeze. Then pack. I find this to be more time consuming and require massive freezer space, I just don't have the luxury of having living in a bustling city (downtown dwellers often have smaller appliances than those found in suburban neighborhoods, more akin to European style appliances). The second method I am discussing is easier, quicker, and makes short work of a heap of bananas. 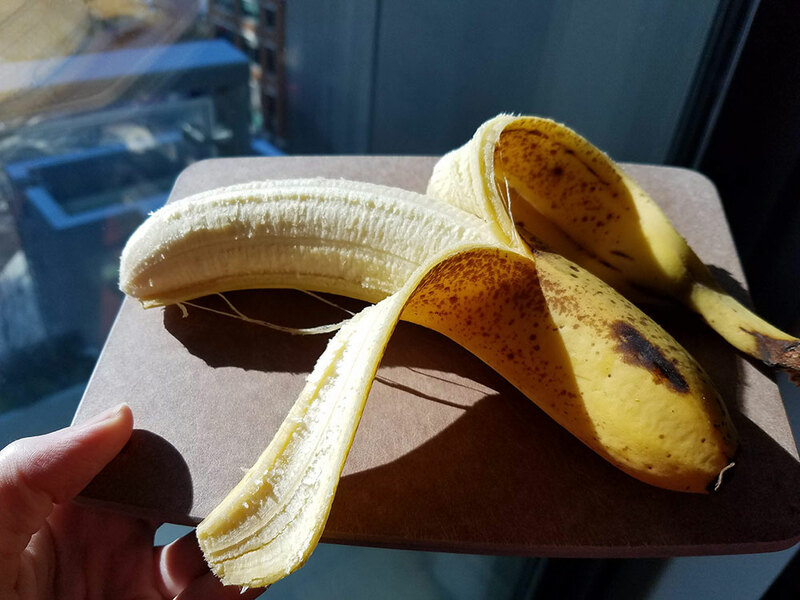 Cut your peeled bananas in half or don't (I cut mine in half because my husband prefers only half a banana in his smoothies so it makes for easy mornings). Slide them into a storage freezer bag in one layer and toss in the freezer, done! 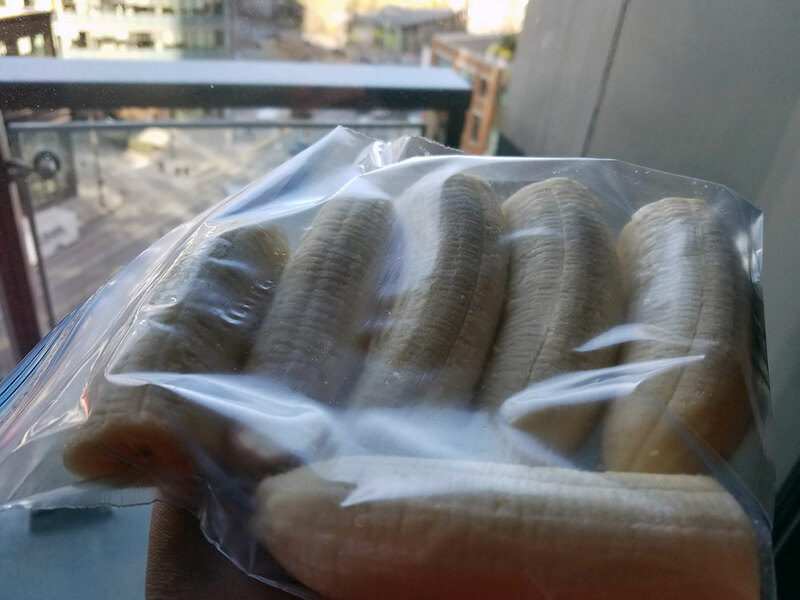 Once your bananas are frozen they are ready-to-use. For smoothies, I like to cut my frozen banana into rounds (your knife will go through them surprisingly easily) before putting them in the blender. I have a high-powered commercial grade Blendtec that can easily handle frozen fruit, but I rather extend my blades life by making things a bit easier for minimal effort from myself - slicing that banana takes less than 15 seconds. 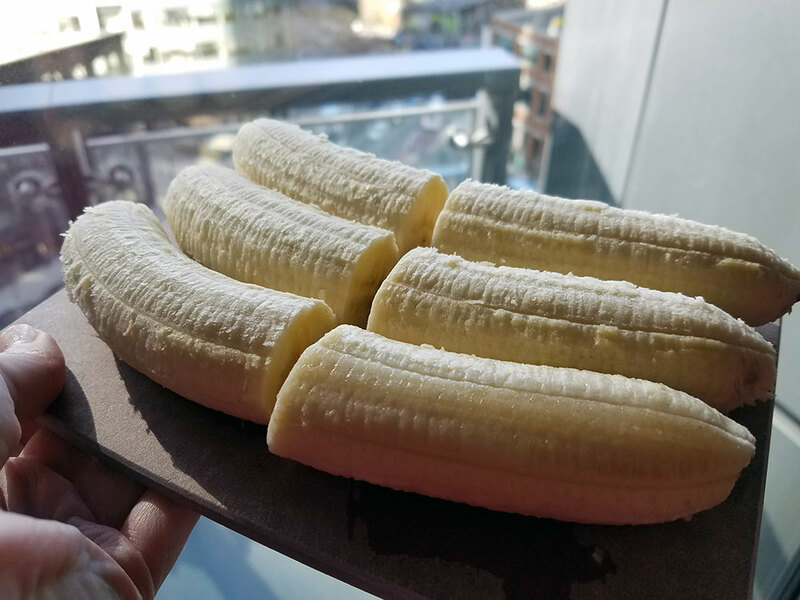 For baking or for pancakes, slice your bananas into rounds and let your bananas thaw to room temperature before using so they are soft and mashable. This can take between 10 - 30 minutes depending on the size you cut them and the temperature of your kitchen. Another cool snack option is eating frozen bananas dipped in your favorite nut butter, seed butter, whipped cream, yogurt, chocolate sauce, caramel sauce etc. Makes for an awesome snack in the summer that has a texture similar to ice cream! Let bananas sit at room temperature for 5 - 10 minutes before dipping and biting into them.